Conversation comes easy to Monique Jenkinson. We sat down together for dinner at her home in the Mission to talk about her work‚ and nearly four laughter-filled hours later I found myself having only just scratched the surface. Of course, it’s exactly this ease with conversation that translates to her ease on stage; I believe it’s what makes Jenkinson’s work resonate with so many. Jenkinson (and her drag queen persona Fauxnique) is a regular performer at San Francisco’s notorious drag/performance event Trannyshack. She’s a fixture of the city’s nightlife, a multi-faceted entertainer, and GOLDIE winning performing artist. 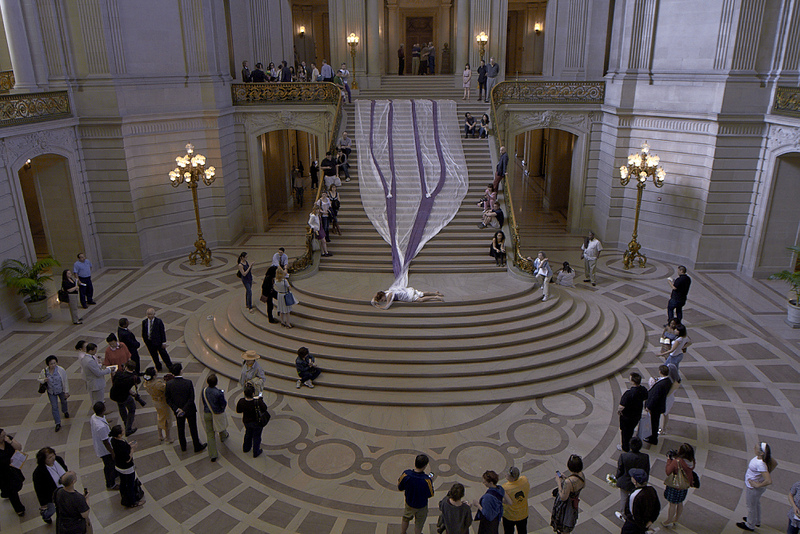 She’s constantly exploring the tensions and connections between art and performance (as she puts it, ‘Yvonne Rainer said “no to spectacle” so that I could say “yes to sequins”‘) and this month she’s performing in San Francisco’s City Hall, as part of the Rotunda Dance Series. Kegan Marling: Monique, you have a long history of creating work in unusual performance venues, whether navigating drunk and rowdy audiences in clubs, quirky 4 x 6 foot performance spaces, or museum galleries. What draws you to these spaces and experiences? Monique Jenkinson: For me, the appeal of these venues has everything to do with the genesis of how I started performing at Trannyshack. I first went to Trannyshack as a fan and I loved the shows. I was truly inspired by what I saw there. It wasn’t just trashy fun; there was artistic rigor in many of those performances. It occurred to me it would be a fun place to perform. With it being a regular show, I could just sign up a week or two in advance, make something quickly and throw it up there. This came at a point when I was performing and trying to create work within the dance world, but was finding few opportunities to hone my craft on a regular basis. Once I started making work at Trannyshack, these performances started becoming a regular art practice, a true performance practice. So what happened to me, especially in the those earlier years of Trannyshack, is that I was performing regularly and I was building an audience base, which were two things that were elusive to me as a dance maker. Making all these short, sharp, quick pieces also got me in this mode of making solo work, and honestly out of the model of ‘oh I have to schedule five dancers and negotiate personalities.’ All those things that come with creating group dance work that can be somewhat prohibitive. They also removed the preciousness. You know, there’s this expectation – you’ve written a proposal, someone has given you space, and then you have to make a piece that’s going to impress them or that will move you to the next level. The stakes at Trannyshack were both low and high: high because the audience is big and vocal, and because I admired everyone onstage and wanted to impress them, but it was also a place that didn’t take itself too seriously. There was a freedom to make something and just see how it lands. And the audience is incredibly receptive… usually. Especially when they’re drunk. (laughs) So you’re not dealing with the same kind of preciousness that sometimes happens in a traditional theater. On top of all that, it’s a great exercise to make something that’s for a 4 x 6 foot stage. Or for a bench on top of a bar. The kind of work you can make and pull off in those situations is really quite different from what you feel you can put in front of people in a theater environment. Hopefully those little pieces have their integrity — and of course some of them fail — but the creative risk and experimentation is tremendously useful for my craft. KM: There seems to be a common assumption that drag is just thrown together. MJ: Or just people moving their lips to a song they’re not singing, while pretending to be a lady? KM: Exactly. Do you find there are differences in how you’re received as a drag artist versus as a dance artist? MJ: You mean, do people assume I’m not serious because I do drag? Well, definitely the more work I do that isn’t necessarily about dance, the more I encounter people who don’t assume I’m a dancer, which I find strange because I believe ‘once a dancer, always a dancer.’ There was a while when I thought maybe I wouldn’t identify as a dancer. And then of course the first time someone neglected to mention it I had to jump up and say, ‘But I’m a dancer!’ (laughs) So I do have an attachment to that background and that set of values being known, but I’ve never felt like people don’t take me seriously because I do this drag queen thing. I try to make sure there is always rigor in my work‚ a dancerly rigor. And I think that comes through. KM: What does rigor mean for you? MJ: You have to know where you’re going. I’m a big believer in rehearsal, and I have constant shame around not rehearsing enough. I’m always catching up. And then of course I spend a few hours of valuable time in the dance studio lying on the floor writing, and also crying. Crying is important (laughs). But rehearsing is key. With lip synchs for instance, I’m watching what my mouth is doing and what the eyes are doing. I’m on my bike singing it, trying to understand how the breath has to be, and how that then shapes the face. A lip synch becomes a very complicated series of facial gestures and you have to mimic this thing that already exists, yet invest it with your own being. KM: With a lip synch, you’re often utilizing references and material from pop icons. What interests you about pop culture? MJ: I feel it’s absurdly uptight to have resistance to pop culture. There are artists who feel that as long as you’re maintaining a safe, ironic distance to pop culture than it’s fine, it’s smart. But as soon as you start to get intimate with the culture, as soon as you admit that you might actually like Christina Aguilera or Britney Spears or Madonna, then it becomes suspect. I’m interested in that zone of unabashed celebration of these pop icons. What’s interesting about Trannyshack is that it allowed me to celebrate my pop icons, who weren’t necessarily Britney or Christina, but it was of the post-punk new-wave art-rock bent like Siouxsie and the Banshees, Kate Bush, Bjork, and Bowie. I could make arcane art references, like having my clothes cut off in celebration of Yoko Ono’s Cut Piece, but in a pop context. KM: How do you find your own balance of entertainment and artistic rigor? MJ: I try to look at my work from the outside to see if it makes sense to people, to try to make it look and feel like something people want to be experiencing. I’m asking them to give me five to sixty-five minutes of their attention. I’m not interested in producing an eye-roll or a walk-out; I’m interested if it provokes a conversation or question‚ but not just for the sake of provocation. Don’t get me wrong, that has its place. I guess maybe my work isn’t considered risky if I’m not concerned with that, but I’m okay with that. (laughs) I’m the kind of artist who does want to entertain. Yes, we have this rigor and we’re revolutionary art producers trying to use philosophies of dismantling the old ways, but in the end, do we end up with an experience of pleasure? I’m not necessarily saying I always aim to entertain, but I think I do want to give the audience some sort of experience of pleasure. That may mean it’s a difficult work, it may be emotionally or intellectually challenging and they may not get it at first, but I want somewhere for there to be an entrance that’s about pleasure. KM: We’ve talked a bit about your work in clubs and such, but I’m also curious to hear about your experiences making work in museums and how you fell into that? MJ: There are so many things we fall into. I always think everyone is planning their careers and mine is just kind of happening by falling into things! But doesn’t everyone think that? I was brought in to the deYoung Museum for their Friday night event, which is not the same as being commissioned as an artist. I was asked to be an entertainer for a party. But I used that opportunity to do something that I would do as a commissioned artist; to converse with the artwork in the museum, to really use the space, and then also keep it fun — it has to be fun for those Friday night museum events, you know, drag queens and four year olds — it’s like a disco birthday party! 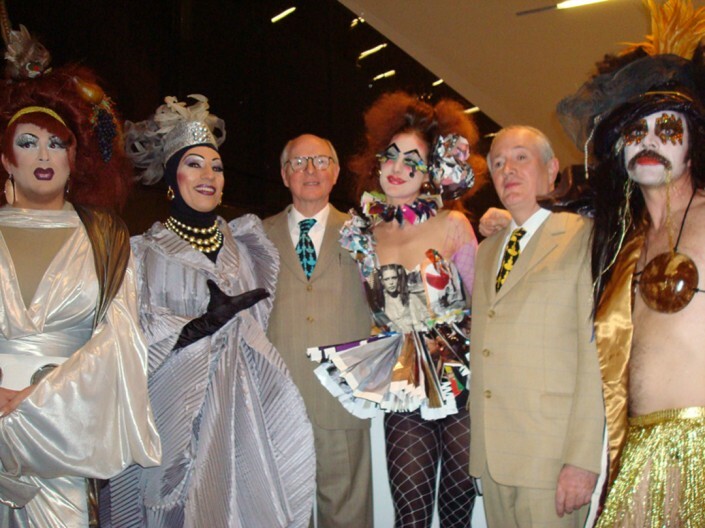 One of my favorite moments was when I did a piece at the opening for the Gilbert & George show in 2008. [Gilbert & George are a gay, art-making couple who have been together and making art together since the early 60s.] I wrangled 3 other queens to join me in paying tribute to their famous work: Singing Sculpture. We each stood on a pedestal with our own sound source, these fabulous purses that hold iPods with speakers on the outside. People had to get really close to hear and we all were doing different songs. In the original Gilbert & George piece, they barely move, so my assignment to the queens was that everyone got only four gestures for the whole song, so there was a lot of concentration required. We were set up right next to the children’s craft table, which I loved, because what we do has so much in common with that – dress up, make-believe artistic play. (Two of my favorite club nights, Tiara Sensation and Some Thing‚ actually have craft tables!) So there were all of these children ambling up to look at the drag queens and they were just fascinated. I had one of my collage outfits on that night so I probably looked a lot like some of the stuff they were making at the craft table. And then we got to meet Gilbert & George, which was thrilling because while a lot of their work is radical: sacrilegious, scatological, political, they are also these really sweet, proper old Englishmen in suits; like, literally: ‘Oh, yes, very well jolly good. Oh, look at your makeup dearie, isn’t it lovely?’ It reminded me of how lucky I am to dwell in such a full, rich world, and to have my work experienced in this context and with this community. KM: And do you have thoughts on what you’re envisioning for the Rotunda Dance Series performance? MJ: I think we get into this cycle of building a project, get exhausted, quickly recover, and then on to the next project so that you can build off of the momentum. I’m feeling right now for me what’s required is not to try to understand what my next project is, but actually to re-investigate what it is that I’m interested in. It’s time for some new practices. Time to refill the well! For the Rotunda, I’m really excited about pulling back and focusing in on duration, creating something that allows the viewer to observe from afar or come up close. I also want to play with a relationship to the fascinating architectural flourishes of the Rotunda, and give people time to really witness the space as well as the performance. KM: I’ve always appreciated the amount of investigation and research in your work. I feel I can easily see you cataloging things, arming yourself with a vocabulary of information. If I flipped open a book of your work, I imagine there would be a whole library of footnotes. MJ: I guess that is another point of artistic rigor for me. You know, I’m interested in work that has the detail in the research so that one person’s experience might be ‘That’s fierce!’ and someone else might catch the manifold layers and connections. Each are important. And I hope those details are present enough in the work to let it become a good conversation with the audience. You know, some of the pinnacles of my life have been conversations with people about things we’re mutually interested in. Or sometimes you get that same feeling from a book. I remember when I read Diana Vreeland’s autobiography and I felt like I was sitting with her and she’s telling me all these hilarious stories about her life. For me a good writer somehow treats the experience not as an exposition, but rather, ‘I’m passionate about this thing and I want you to know about it.’ That’s what I take into my performances — my passion, my curiosity, my investigations — I invite people in and share my experiences. It’s all with the aim of having a rich conversation.